Directions: Preheat Panini grill or any other small grilling device. Bring water to a boil in a small sauce pan & boil chicken for 12 minutes. 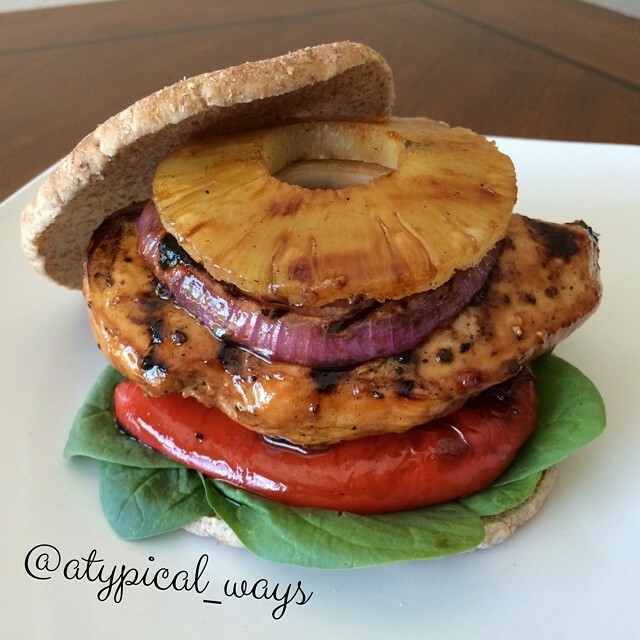 While chicken is cooking cut up the pineapple and grill with the red onion for a few minutes. Once chicken is cooked, shred with 2 forks, season with some fresh ground pepper and mix with the BBQ sauce. 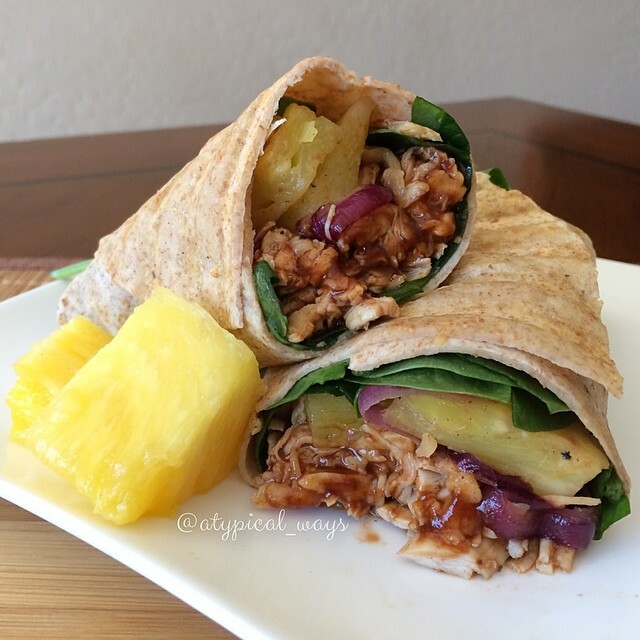 Layer the wrap with spinach, shredded chicken, cheese, pineapple, red onion and a little more spinach. Fold over both sides of wrap and grill in a Panini press for a few minutes until cheese is melted. 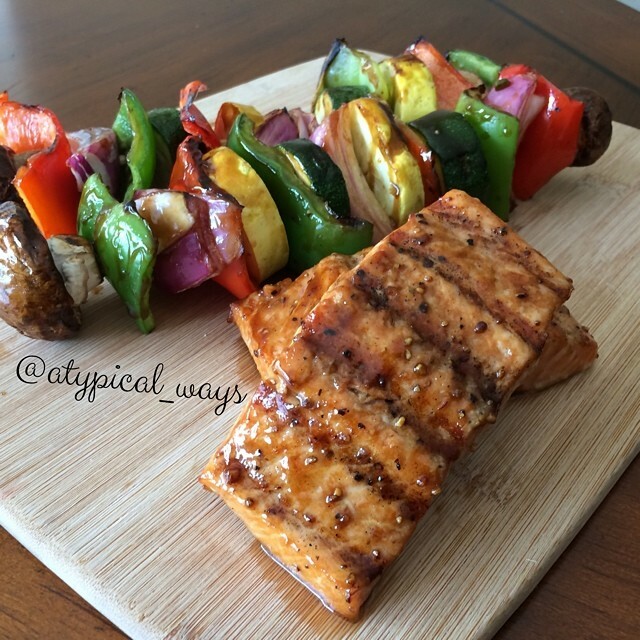 Quick & Simple Grilled Salmon & Vegetables! So easy, my kid could make this! In a small bowl mix together the soy, sugar, water, oil and garlic until the sugar has dissolved. Season salmon/vegetables with some fresh ground pepper. Place the salmon in the bottom of a large zip lock bag and then the vegetables. Remove about 3tbsp of the marinade in a separate bowl (for basting) and then pour the rest of the marinade into the bag. Refrigerate for at least 2 hours. Preheat a grill to medium heat. Add cornstarch to the reserved marinade and microwave for about 30 seconds to slightly thicken it. Thread the vegetables onto skewers (if using wooden, make sure to soak for 30 minutes in water so they don’t burn) and place on grill. I put the vegetables on about 5 minutes prior to the salmon as I used large pieces. Next lightly oil the grates and grill the salmon 6-8 minutes per side until cooked to desired temperature. Basting both vegetables & salmon until cooked.